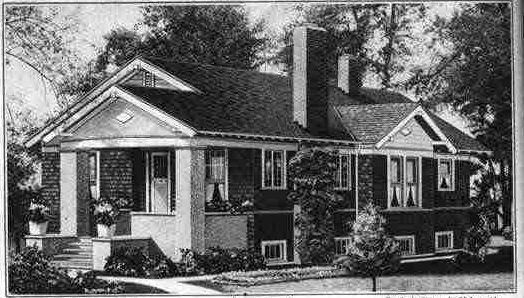 Twice a year I give a class on the Sears Homes of Chicagoland at College of DuPage. This fall, one of the attendees was Jodey Schonfeld of Glen Ellyn. Jodey already had some knowledge of Sears houses since her neighbor lived in a Sears Rodessa that was plaqued by the Glen Ellyn Historical Society. I gave Jodey and the other attendees a list of the kit houses in Glen Ellyn, and she realized her own house was on the list! Her bungalow looked much like a Sears Wellington. 843 Duane, Glen Ellyn. Stupid tree! In the class, we discussed the various ways to authenticate a Sears house. Jodey invited me over to help her look for marked lumber--the easiest way to prove that a house is a genuine kit house from Sears. We had no luck--the wood in the unfinished basement was darkened with age and we didn't find any marks at all. However, there were other clues inside the house that hinted that it was from Sears. Original casement windows in the living room that were sold by Sears throughout the 1920's. Fortunately, Jodey had already contacted the Village of Glen Ellyn to see what information they had in their records. And that information enabled us to authenticate the Wellington. A page of the original blueprints that Glen Ellyn had in its files. A closeup of the lower right corner reads, "Honor Bilt Modern Home". Jackpot! Page of the blueprints that shows the front and rear elevations of the house. The Sears ribbon insignia is in the upper right corner. The building permit was issued in May of 1928. The Sears Wellington was sold from 1925-1930. Now that she has authenticated her Sears Wellington, Jodey plans to apply for a plaque as well. Ah! The wonders of sharing knowledge :) Very cool story, and wonderful authenticating material.